Powerful and moving film of the work of children's charity World Vision through the story of two young children. World Vision, world-wide children's sponsorship charity and one close to the heart of Eden has produced the award-winning film Journey to Jamaa. Journey to Jamaa is inspired by the real-life story of two orphaned children Margaret and Derick in Uganda who undertake a journey that will change their lives after the death of their mother. Directed by Michael Landon Jr and shot on site in Uganda this is an authentic and heart-breaking look at the realities of poverty and its effect on children in particular. Though the subject is hard-hitting there is a definite sense of hope, God has not forgotten these children, far from it they are close to His very heart. Journey To Jamaa DVD by World Vision was published by Word in November 2012 and is our 169th best seller. 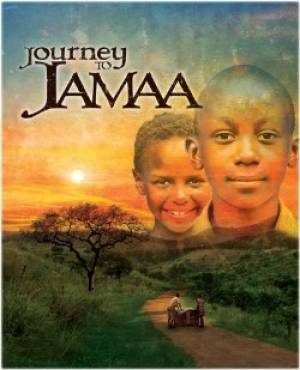 The ISBN for Journey To Jamaa DVD is 853028004020. Be the first to review Journey To Jamaa DVD! Got a question? No problem! Just click here to ask us about Journey To Jamaa DVD. When I first heard about Journey to Jamaa I was desperate to give it a watch, as big fan of child sponsorship and the effect that it has on a child's life I was keen to see how World Vision were going to present such a story. First we are introduced to the two children of the story Derick (Benjamin Abemigisha), the older brother and head of the family and his little sister Margaret (Rachel Nduhukire). Caught up in their desperate circumstances they are forced to go on a journey to find their remaining relatives after the death of their mother. Michael Landon Jr. directed the film and it is excellently shot, filmed on location in Uganda everything is made ever more poignant and atmospheric. The film is extremely high quality and has been created to be shown in churches and house groups to spread the word about not just World Vision but the wider picture of poverty and the opportunity that we have to use the resources God has given us to make a very real difference. At times it is difficult to watch due to the nature of the subject but you will feel yourself drawn alongside Derick and Margaret as they take this journey of a lifetime, encountering a whole variety of people along the way. The way in which World Vision have presented the core of what they do through sponsorship and letter-writing has been done sensitively and as this is based on a true story powerfully reflects the impact sponsorship has. Though the film is not very long at just 42 minutes it makes a huge impact in that time and it would be impossible for you not to be moved, so make sure you have some tissues at the ready!